Western Montanans, and all other comers, will again be able to “ride the rails” on 45 miles of the old Milwaukee Road route between St. Regis and Pearson, Idaho, with the recent completion of a years-long effort to acquire the historic railroad grades. Earlier this month, the Missoula-based Five Valleys Land Trust donated a four-acre parcel of land in Saltese to the U.S. Forest Service – the critical last link in the 45-mile route. Now, the Forest Service owns a 30-mile section of railroad grade on western Montana’s Lolo National Forest and another 15-mile section west of Taft on the Idaho Panhandle National Forest. The Idaho segment is known at the Route of the Hiawatha, and is an established bicycle trail that winds through pitch-black tunnels and across heart-stopping trestles. It is, famously, the route used by railroad crews who evacuated (and saved the lives of) residents whose tiny rail-line towns were overcome by the immense wildfires of Aug. 20-21, 1910. The entire trail system, which includes former rail grades of the Chicago, Milwaukee & St. Paul and the Northern Pacific railroads, is called the Route of the Olympian. Five Valleys Land Trust has worked with the Lolo forest for nearly a decade to bring the trail to completion and management for public recreation by the Forest Service. Both motorized and non-motorized users will have access to the route. “This trail is quickly becoming an icon of recreation in western Montana, benefiting local community members who love to recreate outdoors and those invested in economic development by attracting visitors from near and far,” said Grant Kier, executive director of Five Valleys Land Trust. Lolo National Forest Supervisor Tim Garcia credited Five Valleys with much of the land acquisition work needed to bring the Route of the Olympian to completion. “We are grateful to have them as a valued partner in creating new recreation opportunities that are both highly valued by the public and also increasingly important in promoting economic vitality in local communities,” Garcia said. 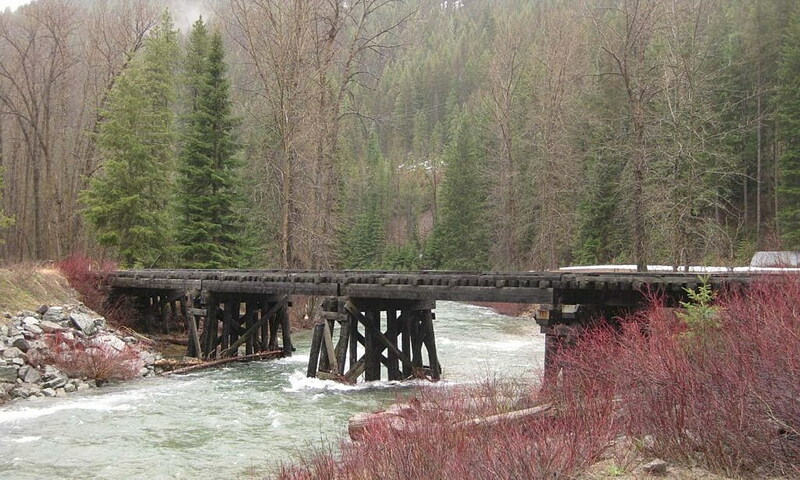 Since 2007, the Forest Service has acquired 13 sections of the former Milwaukee Road and Burligton Northern grades in Montana. Congress provided funds for the first acquisition of five parcels, and the land came into public ownership in July 2007. Eight more parcels were purchased from Five Valleys Land Trust in 2009. The most recent parcel came in the form of a donation by the land trust. The final four acres came into Five Valleys’ ownership four years ago, and has worked since to clear title to the property so the land is securely in public ownership. The Missoula nonprofit received a $15,000 grant from Montana Fish, Wildlife and Parks through its recreational trails program as partial reimbursement for the property’s price. The Superior Ranger District will now work with the local community, including Mineral County – where the commissioners are interested in the trail’s potential to increase tourism – and adjacent landowners. Already, a trail run utilizes the line each year, and snowmobilers enjoy it in the winter. The ranger district will develop a recreation plan for the railroad grade. The Lolo forest’s work on the Hiawatha and Olympian routes ties into the national Rails to Trails program, which now includes about 15,000 miles of trails nationwide.